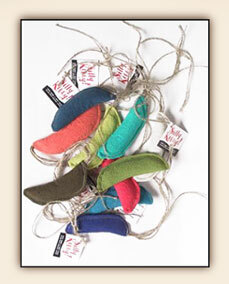 Silly Kitty is a cat toy handmade on Salt Spring Island, BC Canada, with hemp fabric, hemp twine, low- impact, permanent colorfast dyes and filled with organic catnip. Be sure to order more than one! They’re a great size for chasing across a floor, flinging into the air, pouncing on and hugging while kicking at with hind feet! The colors are beautiful and natural. Hemp is easy on the soil, sheds its lush foliage throughout the season, adding mulch to the soil and helping retain moisture. This fast growing plant is naturally inhospitable to pests and thrives without the use of pesticides. Hemp has taproots 9 to 14 feet deep, bringing subsoil nutrients to the surface and protecting the soil from erosion. Hemp fabrics have many advantages. A strong, lustrous fiber, hemp withstands heat, mildew and insects. It is easy to wash, durable and softens with use. By using hemp, the strongest natural fiber, we are ensuring durability - and benefiting our environment.